June 7 makeup for 3/8. June 7 will the last school day of 2014 spring. Click here for the spring calendar. 2014 Spring Contest Winners We're pleased to announce the 2014 Spring Contest winners! Please click here to view the full winner list. Congratulations! 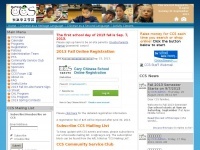 2014 Spring Registration Ended The first school day of spring is January 4th, 2014. A profile of Carycs.org was found on the social network Twitter. The web server used by Carycs.org is run by Weebly and is located in San Francisco, USA. There are many websites run by this web server. The operator uses this server for many hosting clients. In total there are at least 598 websites on this server. The language of these websites is mostly english. A Apache server hosts the websites of Carycs.org. The website uses the latest markup standard HTML 5. To analyze the visitors, the websites uses the analysis software Google Analytics. The website does not specify details about the inclusion of its content in search engines. For this reason the content will be included by search engines.